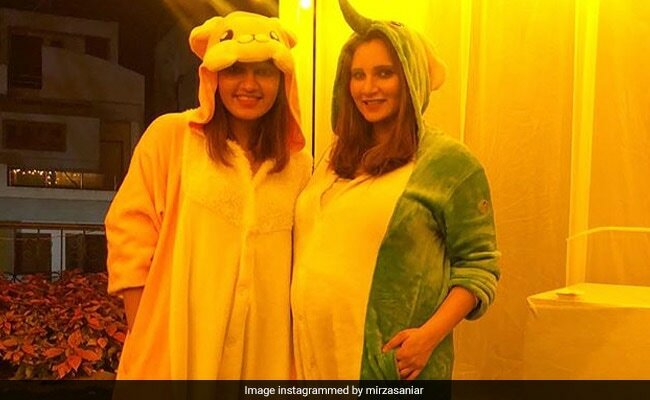 Pictures show Sania Mirza and her sister, Anam, dressed in special animal pyjama sets. Tennis star Sania Mirza seems to be enjoying every moment of her pregnancy. From some gorgeous photoshoots to frequent trips down memory lane, Sania has been keeping her Instagram ticking with wonderful posts. And as if it were possible, Sania has topped it all with her latest posts from her "#NotABabyShower". Pictures and videos shared by her show the mom-to-be enjoying a pyjama party with friends and family. And it looks like a fun time was had by all. "We come in all shapes and sizes but these are all my constants... thank you guys," Sania wrote on Instagram. She also used the hashtags #PyjamaParty and #NotABabyShower in her post. The pictures show Sania and her sister, Anam, dressed in special animal pyjama sets. While Sania opted for a green-coloured elephant set, Anam wore a pink bunny one. Other pictures highlight the special arrangements made for a fun night which included a movie and live performances. Here's a video showing Sania cutting a cake. She also gave a special shout out to husband, Pakistani cricketer Shoaib Malik. "Missed you @realshoaibmalik but duty comes first," she wrote on Instagram. The pictures, as expected, are collecting hundreds of 'likes' from Sania's fans. "Best wishes @mirzasaniar this is super cute!" says one Instagram user. "Nice pictures," says another.